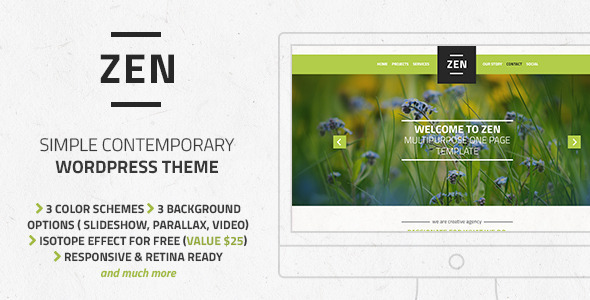 ZEN is multi-purpose one page theme with a blog, it comes in 3 predefined colors, (green, blue and purple) and 3 different background options (slideshow, parallax and video). We have included easy to follow instructions on how to setup and edit, in no time you’ll have your site up and running. This entry was posted in creative, wordpress and tagged architecture, bamboo, blog, flat, landscaping, light, minimal, natural, parallax, slideshow background, video background by Acty. Bookmark the permalink.